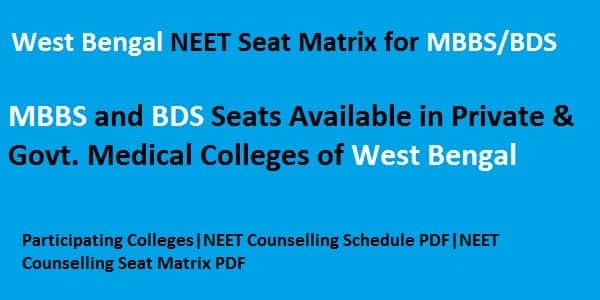 West Bengal NEET counselling seat matrix 2018 is the number of seats available in various private and state Medical and Dental colleges of the state West Bengal. The seat matrix of West Bengal NEET Counselling 2018 will help you to choose the college of your dream. The counselling procedure will be based on one’s NEET Scorecard and will be managed by the Government of West Bengal Department of Health & Family Welfare West Bengal. Throughout the article, you will get to know about West Bengal NEET Seat Matrix for MBBS/BDS courses for the academic year 2018-19. 1 West Bengal NEET Seat Matrix for MBBS/BDS. 1.2 Counselling Process (AQI Quota). West Bengal NEET Seat Matrix for MBBS/BDS. A candidate can visit the official portal of Government of West Bengal Department of Health & Family Welfare West Bengal to get themselves registered for NEET 2018 West Bengal State Counselling. Before we speak the counselling procedure for West Bengal NEET 2018, Let us first have a look at the West Bengal NEET 2018 Counselling schedule. Candidate applying for Medical/Dental Colleges in West Bengal must have to register themselves for the NEET counselling 2018. Counselling of NEET 2018 for All India Quota will be conducted in two rounds in online mode. The counselling will consist of these steps. Reporting to college (Round 2): Here it is to be noted that, those who will be allotted a seat in the second round of counselling (15% AQI Quota) will not be permitted to vacate their seats as per the orders made by the Supreme court of India. Aspirants applying for West Bengal State NEET Counselling 2018 may look into this important datasheet. Let us now discuss the number of seats available in the different state and private Medical and Dental Colleges of West Bengal. Scoring High in Entrance Exam like NEET will help you to choose some of the Best MBBS/BDS Colleges in West Bengal. Top Rankers may also avail various Scholarship offered by these colleges. In case of any problems regarding the counselling, you may contact the student grievance cell of West Bengal NEET 2018.